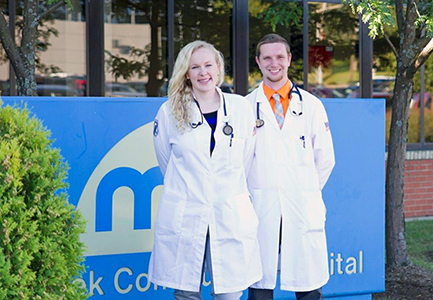 The Family Medicine Residency Program at Millcreek Community Hospital was the first post-Internship Program created at the hospital. For the post match scramble, all interested applicants should complete an on-line residency application. The application is located at Residency/Fellowship Application. If you should have any questions, please call (814) 868-8294. The mission of the LECOM Health Family Medicine Residency is to provide the family medicine resident a training program which provides progressive primary responsibility for patient care in a family environment through a continuity of didactic and clinical experiences. Our program is ACGME pre-accredited as of December 30, 2017. 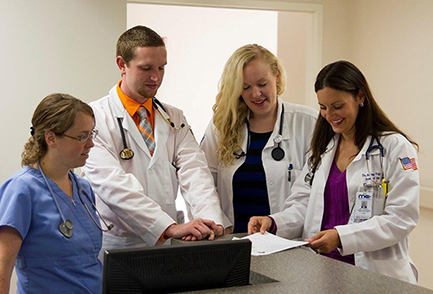 The Family Medicine Residency Program at LECOM Health/Millcreek Community Hospital was the first residency program created at Millcreek Community Hospital. Over the last twenty-five years, the program has successfully graduated dozens of osteopathic family physicians practicing throughout the country. Many of our graduates are now participating in the training of local students and residents. The Residency Program operates two family medicine practices for the training of our residents, each with its own on-site specialty clinics for the further enhancement of the continuity learning experience. Each center is supervised by a board-certified osteopathic family physician. The outpatient experience includes longitudinal care of approximately 400 patients per resident by the time the resident graduates. The resident will gain outstanding experience in the outpatient management of chronic illnesses, preventative care, and child and adolescent medicine. The resident shall work a minimum of 312-half days in the continuity of care clinic with one half day during PGY-1, progressing to three half-days during PGY-2, and four half-days during the final year of residency. The resident will be assigned a panel of patients from the beginning and the patients will remain with the resident for the duration of the residency program. Plaza 18 Medical Center, 537 West 18th Street. This state-of-the-art facility was completely renovated in 2005 and offers 18 exam rooms, video surveillance capability, classrooms and a resident office with internet access. Specialty clinics on site include ophthalmology, podiatry and internal medicine. Eastside Medical Center, 2625 Parade Street. This two-story facility was renovated in 2000 and has served as a neighborhood Family Medicine center for 25 years. It has a well-established residency training patient base. Specialty clinics on site include OB/Gyn, Orthopedics and Podiatry. Core training sites are at Millcreek Community Hospital and UPMC Hamot. Additional assigned rotations to round-out the family medicine experience include geriatrics, dermatology, rehabilitation medicine and psychiatry. Sufficient elective experiences are available within the health system. The family medicine training program is thirty-six months in duration, and fulfills the training requirements for ACGME. The hospital values the participation of its residents in hospital committee and departmental meetings. These meetings prepare the resident for active participation in medical staff activities after graduation. The resident’s education program is to be attended by all residents, and includes journal club and board review. The Resident will sit for three in-service exams (once a year) as well as the certification boards held during your last six months of residency. The AOA certification is offered every 6 months in conjunction with AOA and ACOFP conventions. Residents are required to participate in scholarly activity each year. During their training, residents have the unique opportunity to earn a Master of Science in Medical Education or a Master of Health Services Administration degree from LECOM. Message from Chief Resident, Robert Puckett, D.O. I consider it a privilege to be named Chief Resident. I was not sure at first that I was going to be able to take on the role, but the other residents and interns in the program have made it easy for me. The program itself has provided us with a great learning experience and the continuity of care seen in the clinics as a second and third year resident is amazing. We hope the program continues to grow and provide a strong background to physicians wanting to practice family medicine.